Previously there was a check on the theme that hid replay UI if the coil material wasn't temp control compatible. I removed that check with the update. If you enable replay on a profile using a Ni80 material you should be able to see the replay UI. Make sure replay is enabled by going to the atomizer profile screen. If it doesn't let you save a puff then it's a hard firmware check. Thanks man, I really appreciate ! I was using the older version up until today. I saw the update notification and updated to SP17. I'm not sure what's going on man. I can't reproduce it on my end. May be try a factory reset? Yah I'm aware of that thread. I'm subscribed to it as well. I'm not sure why that's happening. Nothing in any theme should be able to affect something to the magnitude of detecting a false positive on resistance reading. It's also not happening to all the units. Just some. I haven't run into it using any of the 4 DNA color devices I have, and neither has most of the people I've asked about it. Compared to previous versions, only a small amount of fields update when you're firing in Gauges 2.2.0. Only thing that this theme does different than other themes is it displays the status when you're firing only. May be you can try replacing that field with one that shows the status at all time. In any case this is something you should ask Evolv, why would a theme be able to trigger false positive readouts more than other themes? @iLLNESS sure I'll remove some of the graphics that should do it. I am so sorry for the delayed response man I get a notification when someone posts a comment, sometimes I forget about them when I get home I left that screen pretty much untouched from the stock theme. I didn't even think to check for the size. There's plenty of room to fit at least 6 digits there (~1 Million puffs), I'll fix it in the next update. Thanks man! Sorry about the delayed response parrot Most likely, I cannot reproduce it on my end. I have not heard this complaint from anyone else either. May be try redownloading and reflashing the theme? 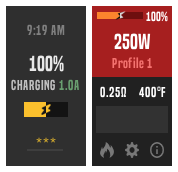 Hey man sorry it took me a while to get back to you Just to clarify you can see the amps when the status is "USB DATA ON", but it shows 0 amps when when the status is "Charging"? Is it 0.0 to be precise? I just downloaded the latest version (2.2.0) from this page and flashed it on three DNA75c devices. All of them show the live amps when charging via a wall outlet. It shows inside the battery icon like shown in the attachment. Sometimes it takes a bit of time before status changes and/or the amp is displayed. Have you tried waiting a little bit and coming back to check it? Hello! As I understand the 75c has reverse battery protection when using a single cell. The 250c also has reverse battery protection even when using a multi-cell setup because it's series. It seems like if I wire a 75c in a parallel setup with 2 cells, and insert one of the batteries the wrong way, it's going to hard short and make the circuit series. Is a P channel FET the best way of building reverse battery protection? This thread was quite useful. These two mosfets look like just the thing I'd need. The specs look about right. I'd really appreciate if someone can chime in. Vapin are you using 75c or 250c? I just tested for voltage drop and it fires the at same voltage as any other theme. You sure it didn't recheck ohms or something? That's super weird man. All I did was take out the condition that required a TC material to activate the replay toggle. I'll look into it tonight. Thanks for letting me know. I'm sorry to hear that man! Lemme look into it and get back to you? In the meantime can you download the latest version and flash it again? Sorry I didn't know the chip was able to show two different messages for those two conditions. I thought like most chips it would all fall under "throttling" or "temp protect". I'll change it back to Temp Protect in the next update. @Pete1burn I was going to suggest removing the custom status from the language tab to see if it helps. If anything you would see the default message that the chip sends. But if it's cutting out your power when it shouldn't it's out of my league. I assume the max puff time is well over the puffs you were taking? When the theme had a flicker (and a half second lag) prior to v2.0 this problem made more sense. I cut down on the number of fields that updates while firing as well. Yeah I decided to go with 2 x PTC fuse on these boards. @VapingBad does it gover 75W only with boost enabled? I raised my max power to 100. I can still only choose up to 75W. If I enable Boost it goes over 75W during a puff. Sorry @Pphish I've been really busy couldn't look into it further. I'll try to figure this out this coming weekend. @Pphish It lets me save the puff when I set the material to a non-tc material. 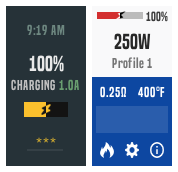 It's actually SS316L, but I set the profile to a watts material. I haven't done the escribe hack to enable Replay for non-tc materials. Is the chip detecting to see if it's temp sensing material instead of going by what I set as the material? I don't have any Kanthal or Ni80 at the moment to test it out. I have a version of all three themes ready to go that uses a toggle to enable/disable replay for non-tc material. But if the chip decides whether to let you save a puff or not I may as well do away with the toggle.